Young Kim at the Basilica of Epiphanius, in the occupied area. During the 2012-2013 academic year, my family and I had the privilege of living for ten months in Cyprus, where as a Fulbright research fellow, I conducted research and wrote a book on the life and work of Epiphanius of Salamis, who was chief bishop of the island from 367-403. I know it is perhaps a bit of cliché to say so, but our time abroad was truly life transforming, and our experiences, while at times very difficult, enriched our lives, deepened our faith, and expanded our perspectives on the world and all of its wonderfully diverse inhabitants. My wife chronicled our time overseas in her own blog, and she focused a great deal on the cultural challenges we faced as a Korean-American family living in a society completely different from our own. For this entry, I would like to reflect on how the current political status of Cyprus potentially impacts the work of scholars who study its ancient past. Cyprus is an island (third largest) situated near the eastern edge of the Mediterranean Sea, and it boasts a population presumed to be a bit over a million total inhabitants. As I have told my friends and people interested in our time there, Cyprus has a very complicated history, and it has experienced a repeated cycle of settlement, conquest, colonization, and liberation for well over 4,000 years. This has had no small effect, in my view, on the ethos of the Greek Cypriots, whom we found at times to be very difficult to get to know in an intimate way and generally less inclined to spend time with foreigners. They do have very close-knit families and seem to prioritize relationships with their kin (which is of course very understandable). 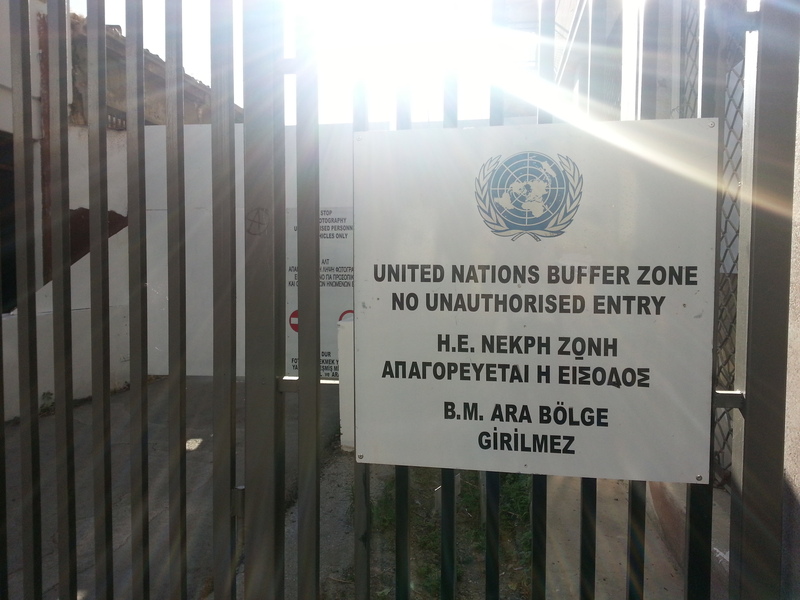 The UN-controlled Buffer Zone. Photo by Young Kim. Since 1974 Cyprus has been divided, including its capital, Nicosia, with about two-thirds of the island comprising the Republic of Cyprus that is part of the EU and the rest considered by the international community to be occupied territory (by the Turkish army). The UN maintains the dividing green line that serves as buffer zone, and fortunately since 2003 it is significantly easier to traverse the two sides. The events that led to this tragic state of affairs ensued after Cyprus gained its independence from the British in 1960, a process which had its own share of conflict and complicated consequences. The current impasse is known as the “Cyprus problem,” and it appears to have no immediate end in sight, especially after the rejection by the Greek Cypriots in 2004 of the so-called Annan Plan. Anyone who follows the news in Cyprus today, in English or in Greek (and presumably Turkish, which I unfortunately have not learned), knows that the Cyprus problem is a regular point of debate and discussion. Furthermore, the fate of the island will not simply be determined by its own denizens, as the polarizing pull of Greece and Turkey directly impact decisions by the leaders of the Cypriot communities. One must also not forget the religious dimension, and the influence of the Greek Orthodox Church of Cyprus is undeniable in the south, while the institutions of Turkish Islam certainly affect the communities in the occupied area in the north. 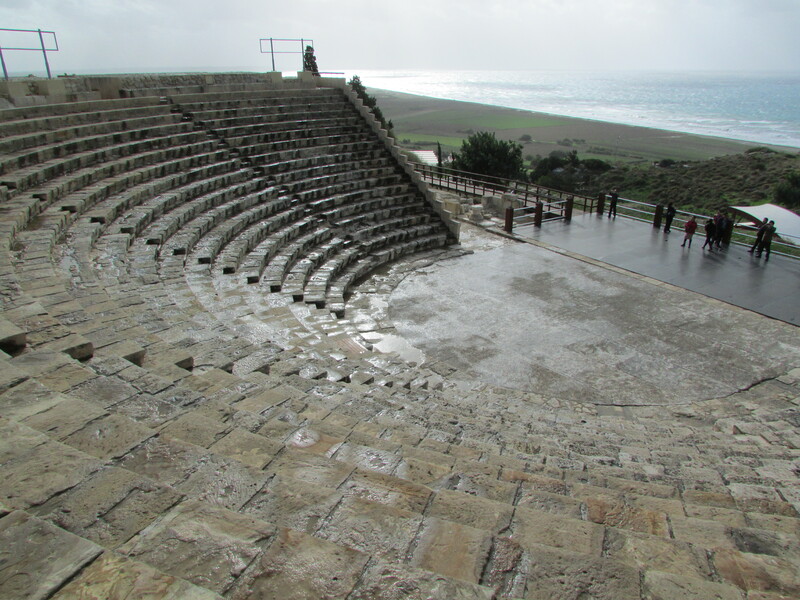 Roman theater in ancient Kourion. Photo by Young Kim. Through the generosity of the Cyprus Fulbright Commission, we lived in the Republic of Cyprus, and I worked primarily under the auspices of the Cyprus American Archaeological Institute (CAARI) and the University of Cyprus. The island is a hub of archaeological excavation and study, and every spring and summer archaeologists and students from all over the world converge on Cyprus to study its rich material past. Cyprus is also of great interest to historians because its strategic geographic location has necessarily resulted in manifold civilizations leaving their mark. There are traces of Greek, Roman, Byzantine, Venetian, Ottoman, Armenian, Syrian, Turkish, and British culture to be found in the food, architecture, language, literature, and art, among other things, all over the island. In my own research, I experienced interesting tensions created by the island’s complicated history. The subject of my study, Epiphanius, lived and ministered in the ancient city of Salamis, also known as Constantia in the late fourth century (it was also a stop during Paul’s first missionary journey). One of the proposed components of my research was to photograph the ruins of Epiphanius’ basilica and other parts of the ancient city to include in my book. However, the archaeological site is situated in the occupied area, and I quickly learned that it was essentially forbidden for me to publish any images I took of the site as it is managed today. Because the north is a non-state (recognized as the Turkish Republic of Northern Cyprus only by Turkey), any excavation (photography included) and publication of results present significant ethical and academic challenges. From the point of view of the Republic of Cyprus, all legitimate archaeological work in the occupied era ended with the invasion of 1974. Thus the north is “frozen” in time, and I discovered that scholars who study Cypriot archaeology and history, especially of the entire island, must reckon with a potential gap in their data. In the end, while my own work was minimally affected, nevertheless I learned how the island’s past could impact what I thought was generally an esoteric, academic subject. 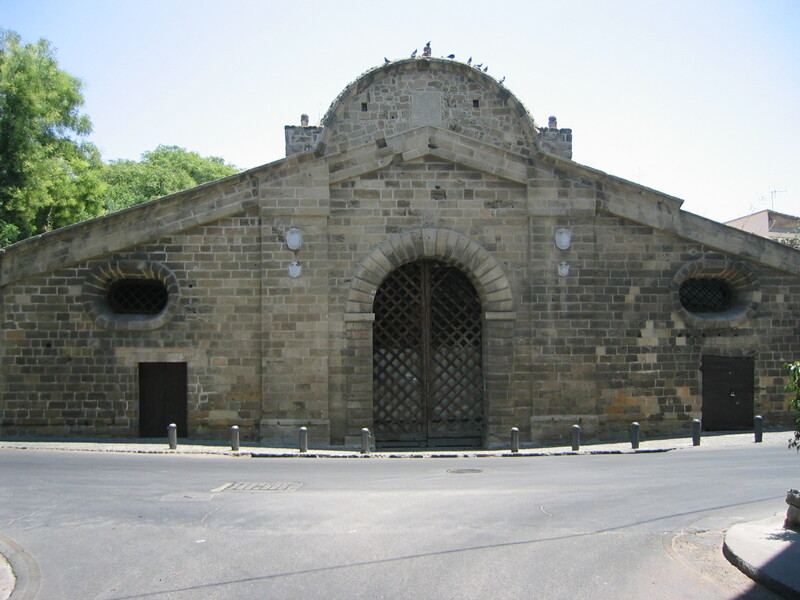 The Faumagusta Gate in Nicosia. Photo by Young Kim. Another tension I felt came quite early during my stay in Cyprus. I was invited to (and attended) a conference hosted at the University of Nicosia, which included several scholars from European countries, but also had participants from universities in the north of Cyprus. There are, in fact, several universities in the occupied area (with very limited accreditation) that are thriving and burgeoning with many international students from the middle east and Africa. At the time, I was completely unaware of the controversy that preceded this conference because of the make-up of its participants. I learned fairly quickly about the complex intersection of international politics and academia. I am happy to report that my book on Epiphanius is finished and will be published next year by the University of Michigan press. But I am thinking that my connection with Cyprus is not over, and I am mulling a new research project on the history of the island in late antiquity. I also know that the next time I return to study this fascinating place, I must be mindful of the challenges resulting from the ongoing dilemma of the Cyprus problem. But here’s to hoping that in my next visit, we will have an answer. Young Kim is associate professor of history and chair of the classics department. During the 2012-2013 academic year, he was the senior Fulbright research fellow at the Cyprus American Archaeological Research Institute. 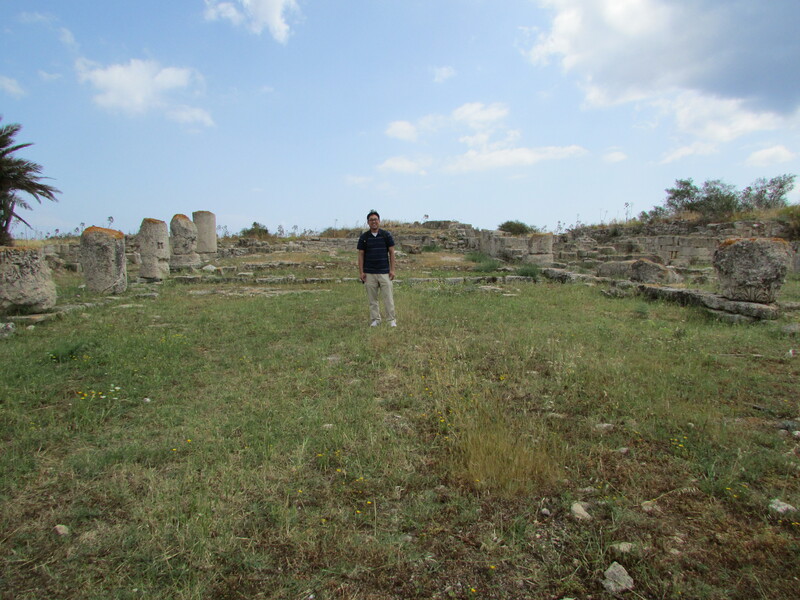 This entry was posted in Young Kim and tagged antiquity, archaeology, CAARI, Cyprus, Fulbright, history, Nicosia, scholarship. Bookmark the permalink.